Here is a breakdown of our total fees including the WellAttended and credit card processing fees. We don't require contracts and free events are free! We use Stripe as our credit card processor to collect payments. This makes it easy for you to manage your sales and refunds. Your money will be deposited directly into your bank account within approximately two days of each sale. If you are unable to use Stripe, we can always send you a check! How does the WellAttended fee and payment processing fee work? 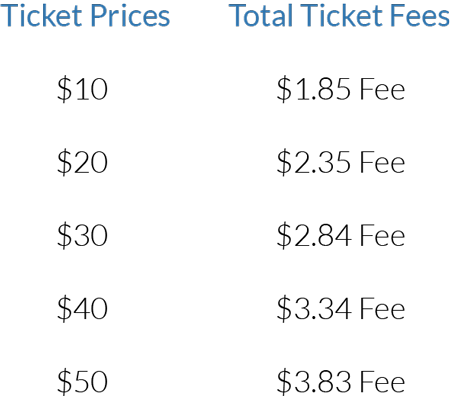 The fees get automatically added to your ticket price at checkout. Don’t worry, we do the math for you! Can I pay the fee instead of my ticket buyers? You sure can. It’s simple to add the fee to your ticket price. You can change this setting with a couple of clicks. What costs are associated with Stripe? Stripe is free to use. There are no monthly contracts or fees. Just create an account and start receiving payments. Do refunds include processing fees? Yes! When you issue a refund, the ticket price and processing fees get returned to the ticket buyer. Can I host a free event? Yep, and it’s completely free. Simply create a WellAttended account and set your ticket price to $0. Send us an email to hello@wellattended.com. We are always happy to chat. WellAttended is incredibly easy to use with all the functionality I need. I recommend WellAttended to anyone looking to sell tickets to their theatrical event. I love working with WellAttended. It's super easy to use and is built from an event producer's perspective. It has all the tools I need and nothing that I don't. I love that I get paid as my tickets are sold. I've used other services in the past and on all of them I had to wait, sometimes months until I got the payment. WellAttended is very user friendly, they have phenomenal customer service, and they have innovative and useful marketing programs that have been of great value.